What does a Business Strategist do? If you’re a part of the online small business world you may have heard the title “Business Strategist” thrown around a lot. You may be wondering, what the heck do these people actually do? Can they really help me? And what does strategist even mean? Well if you didn’t know, I’m a Business Strategist. So today I’m going to break down for you: the definition of a strategist, what working with a strategist looks like, and what qualifies someone as one. According to Merriam Webster the definition of strategy is: “a careful plan or method for achieving a particular goal usually over a long period of time” or: “the skill of making or carrying out plans to achieve a goal”. So with that being said, a Strategist is someone who creates the plan for you to follow so that you can achieve a goal. Simple enough, right? So I told you the definition of strategy, and in short what a strategist actually does which is create a plan for you to achieve a goal. But what does that really mean? Why do strategist have sessions, or packages, and what do you actually spend your time together doing? So while everyone’s process may be a bit different, I’ll give you an inside look at mine! When a client is interested in working with me the first thing I have them do is sign up for a consult call. I recommend that if you are interested in working with anyone for a period of time and for a good amount of money, it’s best to talk with them on the phone or via video chat to make sure you’re a good fit. On that sign-up page for the consult call there is a short questionnaire for them to fill out so that I can get to know a bit about their business before we get on the phone. The main three questions I have for them are: (1) “What challenges are you currently facing in your business?” (2) “What does your dream business look like?” and (3) “If you could accomplish one thing as a result of investing in strategy sessions, what would it be?”. These three questions give me a clear picture of where this person is, where they want to go, and what is most important for them to solve or reach. So that’s where we start and what I talk to them about on the consult call. On the call I will honestly tell the person if I’m a good fit for them or not. If I can help them then I will tell them the things we need to work on in order to get them from where they are to where they want to be. That could be: creating a new business model with packages, services, or programs that all work together to bring in money for you seamlessly, or defining who your most valuable clients are, or creating your sales calendar, + marketing plan for the year. So by now we know what we need to work on and I have a plan for what we need to spend each session doing. At the beginning of each session I ask you what your wins were since our last call and what you were able to accomplish. Then we get into the task at hand for the day, example: creating an autoresponder to nurture your new subscribers into customers. I give you my ideas and suggestions and we come up with what the best fit for you and your customers is. At the end of the session I always give you clear action steps to follow through on before our next call. These are steps to continuously move you closer to your goal. As I mentioned after sessions you have your action steps, also after sessions I usually have my own homework to do for you! I go to work at researching and creating the plan that we will eventually get to in the end and I am prepping for our next session. So not only do I spend time on the phone with you for our sessions, I also spend time creating the plans and brainstorming ideas for you off of the calls. At the end of the sessions and our time together we end with a plan. Whether it’s an action plan or a marketing plan, you will have a step by step plan to follow to hit your goal. As I mentioned earlier this is what strategist do: they create plans. And while you may definitely see results while you’re working with a strategist, it’s more likely that you will see greater results in time, as you begin to implement the plan that was created. Unfortunately anyone can pretty much call themselves anything these days. So anyone can decide to put the title “Strategist” on their website and instagram bio. But in my opinion what qualifies someone as a strategist is their training, education, and experience. For me personally, I went to school for Business Management and received my Bachelors of Science Degree. After college while working at a corporate job, I spent all of my free time reading, and taking online courses on all things business. Even now that I have my own business and am a certified strategist I spend minimum 10-15 hours each week reading, learning, and testing new methods and skills. While education is super valuable and important, I don’t think it is the end-all be-all. So just because a strategist doesn’t have formal education, I wouldn’t qualify that as a reason not to work with them. Even though I have a bachelor’s degree in Business, once I actually started working with business owners for free to practice my skills I knew that it wasn’t enough. I wanted training from someone who had done this already and been successful at it. That’s when I found Tara Gentile. Tara is a very successful Business Strategist who has now developed a Business Training company (called Quiet Power Strategy) to teach business owners how to successfully grow their businesses. She also trains and certifies people who want to become Business Strategist. So after months of training and mentoring under her I received my certification as a Strategist. While this certification has played such a HUGE part in my success, and has given me the systems + know how I need to help my clients reach success, again I don’t think it is the end-all be-all to hiring someone as a strategist. Working with someone who is certified is awesome, because you know they have been through training, and have been supervised while working with “test” clients so that they have experience. But the last word here is the most important – experience. After college I started working with clients for free to practice my skills. Then once I was going through my training to receive my certification I had to work with clients on the systems that I learned. After that is really when my business picked up and I started consistently booking paid clients to help them grow their businesses. In 2015 my friend Heather Crabtree who is a Business Mentor and Founder of the Savvy Business Owner community hired me to be a Team Leader in her group coaching program the “Savvy Business Circle”. Soon after my personal mentor Tara Gentile hired me to be a Strategist for her group mastermind program “Quiet Power Strategy: The Foundation”. Working as a Strategist in these two programs has developed my experience quickly because I was able to work with groups of entrepreneurs at a time instead of my usual 1-1 clients. To me, experience is the most important factor in qualifying someone as a strategist. Have they created a successful business in the past? Or have they helped others create successful businesses? Is their current business successful? Look at their website, look at their testimonials, and case studies, and reach out to their clients to ask how their experience was! Whew, that was a long post! 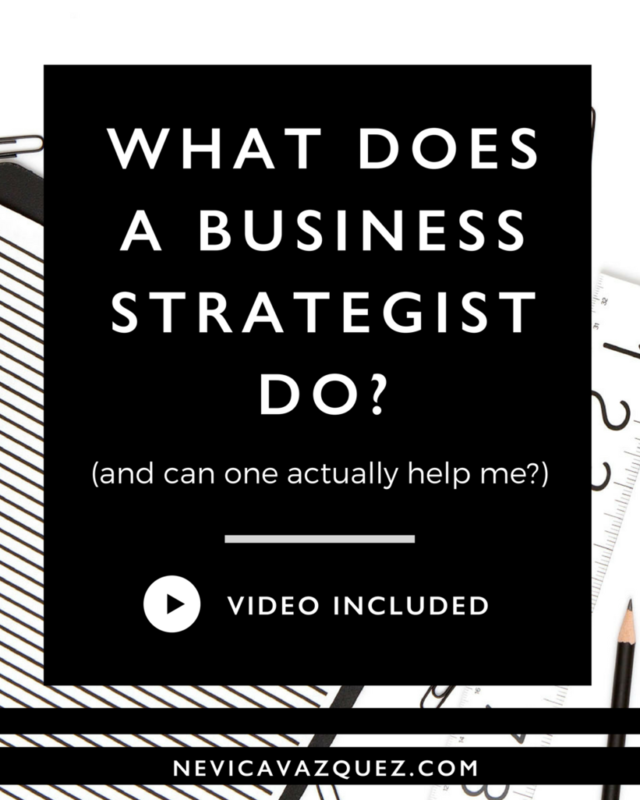 I wrote this post because people are always asking me what a Business Strategist does. So I hope that this post helps you understand what Strategist do, how they can help you, and how to know if they are credible. Because there are so many other questions about strategist, I will be following this post up with two others. (1) When to hire a strategist (2) How to find the right strategist for you. So keep an eye out for those! In the comments below let me know: Do you think you need to hire a strategist? I'm Nevica, Business Strategist to digital bosses who want to scale their online biz. Together, my clients and I, create the online biz plan they need to get to their next level of business. Are you a digital boss? Check out how we can work together here. Wow, this has been such a great help in clarifying what a strategist does. I’m looking forward to sharing my experience with you as I find myself stuck in the midst of something I’m uncertain of after having an epiphany that I’m not one to run a business based on my natural creative talents, but to help people in similar entities grow their businesses. I really could use some pointers and honestly can’t wait to hear from you. I’d love to hear more about this epiphany you’ve had about supporting other business owners! This was I opening. I appreciate you sharing. I want to be a business strategist. I’m currently a realtor but my passion helping other communicate, market and grow sales in their business. I don’t have a degree but it is a passion of mine. I feel stuck because I don’t have income invest in both but I don’t know what to choose to focus on. So glad that this post was helpful for you! I’d say start by helping strategy clients on the side, keep you job as a realtor to pay the bills, but in your free time educate yourself through free online resources on growing a business. Then use that knowledge to help others, and get their testimonials of how you’ve helped them to start growing your portfolio as a strategist. Also, I’m sure there are A LOT of skills in realty that transfer to growing a business. So the skills you’re learning in your current job will definitely help you grow as a strategist! Thank you for this insightful post. I have always wanted to be a Management Consultant, which I believe covers a lot on growing businesses. But the opportunity never came and started off working in a consulting company. I have had little experience working with small businesses, even though it never turned out all positive, I still want to try again. After reading this, I just want to see how I can further develop myself in various Strategist skills. Signing up for a training will be my major goal now. Thank you again. I’m so glad that this post was helpful for you! I think starting in a consulting company is great experience for being a business strategist! So glad that you’ll be looking into more training! I also recommend getting some practice by using your consulting skills to help small business owners you already know for free, to better understand what they need. Best of luck AdeDamola! Hi Nevica! Thanks a lot for sharing this post, very insightful. I am finishing MSc in International Business and Development this year and would love to embark on the path of International Business Strategist/Analyst career. I know this is a bit of a broad question, but what would your recommendations be? In particular, what are the suitable jobs which will allow me to gain the best suitable experience. I am based in London. Many thanks. Thanks so much for your kind words and for your question. Unfortunately I’m not sure I’m best suited to answer this question. The Business Strategist certification I took was specifically for people who want to start their own strategy practice and who want to help small business owners. I’m sure with your degree you will have many more opportunities! I always think that starting with a job at a company you believe in is the best way to start. This way you can gain experience in your field while getting paid by someone else, and if you want to eventually start your own business you can use that experience in your business. For a better response I would go on Linkedin and look for other Business Strategist with a similar degree to yours and ask them about their experience and recommendations! thank you so much for this write up. I feel this urge of helping people achieve their goals using my own ideas but a times, it seems that am too small to do that because I have no educational qualification though am still aspiring for admission into a higher institution. I love impacting in people useful ideas that will help them succeed in their field of expertise. I’m so happy you found this post helpful! While educational qualifications can help, they aren’t necessary. You can start helping people with what you know today! At the same time you can continue to educate yourself through books, online courses, and other forms of training that are more accessible. Once you have used what you’ve learned by testing it out yourself then you will have data and results to learn from that you can use to help you better help other people! I’m excited for you to take action and use your skills to help others! Thanks so much for sharing your story with me! Congrats on your recent graduation! I can tell you what I would do if I was in your shoes! I would personally apply to consulting firms to get the step by step training. That training is going to be priceless and will help you gain SO much experience. You can work there for some time to get the training and experience and when you’re ready you can take that training and experience over with you to your business. It will make running your business such an easier transition because you will be an expert at your craft and have learned systems and strategies from the best! I hope this helps Mallory! Hi Nevica, this is what inwant to do but not sure where and how to start. I know i can do this but not sure where to start? It depends where you’re starting from! Since I’m not sure where you’re starting from, here re some suggestions. 1. If you know who you want to work with, start doing client research to find out what people need help with and how you can help. 2. If you know what people need help with, JUST START, start helping them for free and as you work with them you’ll learn more about how to package and price your offer. 3. If you know how you want to help people, start outlining your process of how you can help them. 4. If you need to learn more about business strategy I would spend time reading, listening and researching building and growing a business. And testing/practicing what you’re learning to see what works and what doesn’t work so that you can help others. I hope this helps Niniza!